Barred Owls inhabit forests, especially deep, dark woods. Gestation is 28 to 32 days. 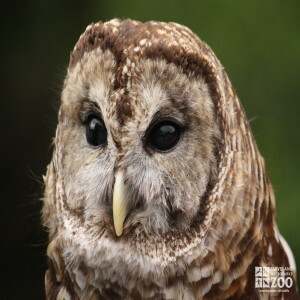 Barred Owls sometimes hunt and even hoot during the daytime, especially in cloudy weather. Best known of its hoots is the sound described as “who cooks for you, who cooks for you all”, but it can also sound like the barking of a dog – and spit like a bobcat. They are the fourth largest North American owl. The feet are small and weak, and it seldom attacks large prey. It has virtually no predators to fear, but its tormentors are crows and goshawks. Barred owls are quite harmless and try to appear horrifying. What they lack in genuine ferocity they make up in acting ability. A barred owl will glide directly toward a birder’s eyes, break flight seconds before contact, and perch a few feet away, glowering menacingly. It will swell its neck, puff out its chest, crane its head, and distend its already bulging eyes. Then it will take a deep breath and pour out a torrent of strixine obscenities guaranteed to unhinge the listener. Incubation is by the female barred owl alone. The young are brooded for about three weeks, while the male provides food, and the owlets take about 6 weeks to fledge. It is some time, however, before they reach full independence.